Taking a stand for Cubism. 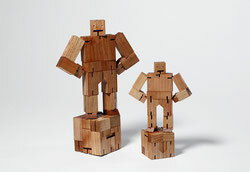 ancient Japanese traditions with contemporary toy culture. And best, perhaps, is that they neatly fold up into unassuming perfect cubes. From the David Weeks Studio (http://www.davidweeksstudio.com/). It's going to be ending of mine day, except before end I am reading this impressive article to improve my know-how. Do you have a spam issue on this blog; I also am a blogger, and I was wanting to know your situation; many of us have created some nice procedures and we are looking to exchange techniques with others, why not shoot me an email if interested. Hi would you mind letting me know which web host you're using? I've loaded your blog in 3 completely different internet browsers and I must say this blog loads a lot faster then most. Can you suggest a good internet hosting provider at a honest price? Thanks, I appreciate it! Hi there, i read your blog occasionally and i own a similar one and i was just wondering if you get a lot of spam responses? If so how do you stop it, any plugin or anything you can suggest? I get so much lately it's driving me mad so any support is very much appreciated. I've been exploring for a little for any high-quality articles or weblog posts in this sort of space . Exploring in Yahoo I finally stumbled upon this web site. Reading this info So i am happy to exhibit that I have a very excellent uncanny feeling I found out just what I needed. I most indubitably will make certain to don?t forget this site and give it a look on a relentless basis. Hi! I just wish to give you a big thumbs up for your excellent info you have here on this post. I will be coming back to your website for more soon. Hello! I could have sworn I've visited your blog before but after looking at some of the posts I realized it's new to me. Anyhow, I'm certainly happy I stumbled upon it and I'll be bookmarking it and checking back frequently! Pretty part of content. I just stumbled upon your site and in accession capital to claim that I acquire in fact loved account your weblog posts. Any way I'll be subscribing on your augment or even I fulfillment you get right of entry to persistently quickly.